Before you decide whether you should upgrade or not, it’s best to fully understand copy protection and how it will effect your decision. If you are using WMC to receive free OTA (Over The Air) or ClearQAM digital cable television broadcasts, copy protection does not enter the picture and WMC can more easily be replaced if you decide to upgrade to Windows 10. If you are receiving cable television broadcasts, copy protection may effect your decision to upgrade. Most cable providers now encrypt their television signals so that only authorized subscribers can receive the content. Deciphering this encrypted signal is the job of the CableCard which is inside your PC’s TV tuner card. Encryption is not the same as copy protection. They actually have nothing to do with each other. 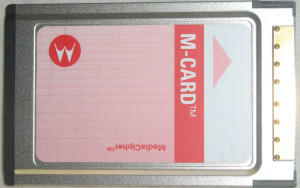 One of the most popular M-Card CableCards used in set-top boxes, TiVo, and PC tuner cards. Once the CableCard has determined that you are allowed to view the content and it has decrypted the television broadcast, then you can view and record live TV. Copy protection determines what can be done with the live and recorded television content. Some cable operators mark all their television content as “copy once”. This simply means the content can be watched live, recorded, or played back on one device. It cannot be edited, copied, moved, or shared with any other device. The content must be watched on the PC which received and recorded it. One exception is the use of Windows Media Center extension devices. These devices are considered extension of the original device that received the content. In the situation of copy once content, you MUST HAVE Windows Media Center as of this writing since no other software is licensed to receive copy once television broadcasts. Furthermore, since you cannot copy, move, edit, or share this content; you must watch live TV or view any recordings on the PC which originally received them. Upgrading to a new operating system will essentially make your PC appear as another PC and any WMC content would not play due to copy protection. Of course, this is a mute point since Windows 10 doesn’t support WMC anyway. Bottom line: if you will be receiving or already own “copy once” content, upgrading to Windows 10 is not a practical option for you. Luckily, copy once is not the only form of copy protection. Some cable television content is marked as “copy free” or “copy freely”. This simply means the content can be edited, copied, moved, and shared among other computers and devices on your home network. One word of caution, “copy free” does not mean that you may freely distribute the content since it is bound by copyright laws. If you have copy free content already recorded and most or all of your television channels are copy free, then upgrading to Windows 10 may be in your future. Existing content can either be converted to another format besides .WTV before upgrading to Windows 10. Or once the upgrade takes place, install software which installs the proper video codec so that Windows Media Player can view .WTV content. For example, installing MediaPortal under Windows 10 will allow Windows Media Player to playback .WTV files with no problems and give you a fully functional TV/DVR solution. In the event that you “think” you can live without Windows Media Center, what are the alternatives? If your cable provider only broadcasts programs marked as copy once, you have very few options involving your home theater PC. At the moment no other computer-based DVR software can access copy once content. If you want to use your home theater PC to watch and record copy once content, you have no other alternative but stay with Windows 7 or 8.1 and DO NOT upgrade to Windows 10. For owners of the SiliconDust line of HDHomeRun PRIME, CONNECT, or EXTEND devices, SiliconDust is working on the new HDHomeRun DVR which will allow you to record and watch live protected (and unprotected) content without the need for Windows Media Center or an always-on PC. There is currently a project in the works and the final product was supposed to be shipping in September 2015 but is running late. To learn more about it and make a monetary contribution head on over to HDHomeRun DVR: The DVR re-imagined. This blog is not affiliated with this project in any way. For content not marked as copy once, you will be able to upgrade to Windows 10 and then install another media center style software. However, you will need to find another way to watch any channels that are marked as copy once. Most premium cable content is available for viewing online; but may incur additional monthly fees. You will need to check your cable providers website, Hulu Plus, Netflix, or the channel’s website. 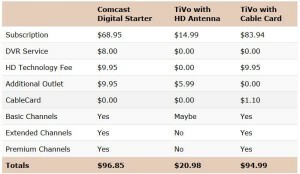 The costs of a TiVo Roamio with and without cable compared to cable alone. Other solutions include renting equipment from your cable provider. Other than the higher monthly costs of renting equipment for the entire house, the cable company solution should work just as well as Windows Media Center. In fact, most of the major cable providers have cloud based DVR solutions which allow you to record six or more shows at once and view it in any room or on any device in your home. 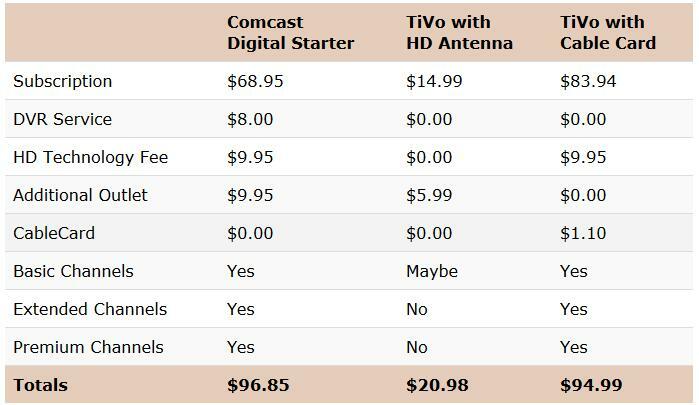 A few good examples: Comcast X1 Platform, Verizon FIOS, AT&T U-Verse, and DirectTV. Of course TiVo is another option for watching and recording copy once protected content. Read my TiVo Roamio Plus DVR and Streaming Media Player review to see its right for you. In the event you are using Windows Media Center to view and record copy free content, you have many more choices. ClearQAM and OTA broadcasts are treated the same as copy free since these types of content do not have any copy protection. Deciding to upgrade to Windows 10 will change your home theater setup in this case but it’s not going to kill it. But you will be losing Windows Media Center. Note: There is a hack method of using Windows Media Center with Windows 10. I personally have tried this method but was not entirely successful. For more details see Here is How to Install Media Center on Windows 10 (this is not a recommendation or endorsement). While none of the alternatives are as good as WMC in my opinion, there are a few Windows Media Center alternatives out there that have quite a following of their own. The more popular alternatives are Kodi (formerly XBMC or XBox Media Center), MediaPortal, and NextPVR. In addition, many computer TV tuner makers also supply their own DVR or PVR software. For instance, Hauppauge supplies WinTV with their products. It is best to try out several alternatives in advance before deciding to upgrade to Windows 10. Make sure the software installs properly and works correctly with your TV tuner. It is also advisable to see if the software will be compatible with Windows 10. If the software works with Windows 7 or Windows 8.1, it will most likely function correctly under Windows 10. Once Windows Media Center is gone, you won’t be able to watch any of your previously WMC-recorded content. Non-copy protected content can be converted from the WTV format to other common formats that can be played on many devices. There are numerous free and paid software programs that can convert WTV files into many other file formats. Or installing a video player such as VLC Media Player will allow you to view WTV files on your PC. I found installing MediaPortal beforehand allowed me to watch WTV files once the Windows 10 upgrade was finished on a test PC. Obviously, copy protected WTV files cannot be converted or played due to licensing restrictions. Once Windows Media Center is gone you cannot watch any previously recorded copy once content. Read the previous sentence again and carefully consider how upgrading will impact your video collection. If you access Windows Media Center from other rooms through the use of an WMC extender, your new software solution will need to contain a TV server as well. The TV server will need to be installed and configured on the PC with the TV tuners. Your other TVs will need to connect to a PC running the client-side version of your DVR program. There also are Smart TVs and media streaming devices that can connect to the host PC. Once again, you will need to do your research before advantage of the free Windows 10 upgrade. Some devices such as the Ceton Echo, function only as Windows Media Center extenders and will not work without WMC running on the host PC. If you have a device such as this one, you will need to find another solution for connecting to your host PC. This is not a big issue technically; but it does create additional costs for you to incur. And of course you may decide to ditch the home theater PC altogether and rent equipment from your TV provider or purchase a stand-alone DVR device such as a TiVo as previously mentioned. In the event you want to upgrade to Windows 10, I have some suggestions that you should keep in mind. As with any upgrade, you should make a full backup of your computer system. Use Windows 7 Backup and Restore to make a system image of your entire Windows installation. Windows 10 allows you to restore your previous system in the event you don’t like your new upgrade. However, the restore process can fail. A full system image backup adds an extra layer of security. I was able to fully restore my test PC in about 30 minutes to go back to Windows 7. As I suggested earlier, try out some other Windows Media Center alternatives. I tested out MediaPortal on my PC for an entire month. I found it rather cumbersome to setup. But once I had it working, MediaPortal was easy to use and very reliable. Most of the time I found myself missing the finer points of WMC so I switched back. If I had to live without WMC, I would switch to MediaPortal. Since I already have MediaPortal installed and working, I would be able to use it immediately after the Windows 10 upgrade is installed. Plus, MediaPortal installs the necessary software to play WTV files. My backup plan is in place in the event I decide to switch Windows 10 in the near future. Don’t forget, you have until July 29, 2016, to take advantage of the free Windows 10 upgrade. There’s plenty of time to decide what you want to do. Personally, I’m considering making my current PC into a dedicated HTPC and leaving it at Windows 7. Then I’ll get a new PC with Windows 10. 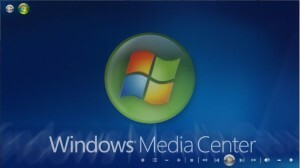 Let me know what your plans are for Windows Media Center in the comment section below.